The EUR/USD is extending its gains amid a calm market mood. Draghi's testimony could provide clues to the next steps of the ECB. The technical picture looks quite bright for the pair. The EUR/USD is trading in the mid 1.1700s, the highest levels since June 14th. On that day, the President of the European Central Bank Mario Draghi shot down the common currency with dovish tones, most prominently with the pledge to keep interest rates at current lows levels "through the summer of 2019". Since then, ECB sources said that late 2019 might be "too late" and they helped the pair recover. In his two-staged testimony before two committees in the European Parliament, Draghi may provide updated views on inflation, which rose on the headline but missed on the core. Another interesting point will be the concerns about trade. Reports suggested that ECB members are more worried than they seem to admit. Will Draghi express concern? With the recent rise of the Euro, Draghi would prefer it to fall back down. However, he may be willing to actively express dovishness to reach that goal. The rise of the pair is also due to the weakness of the US Dollar. The Non-Farm Payrolls report beat expectations on the headline but missed on wages, and the greenback lost some ground. The move was exacerbated by the sanguine mood that markets adopted after the US tariffs on China came into effect. The calm, summer, atmosphere continues, and this is good news for the pair. 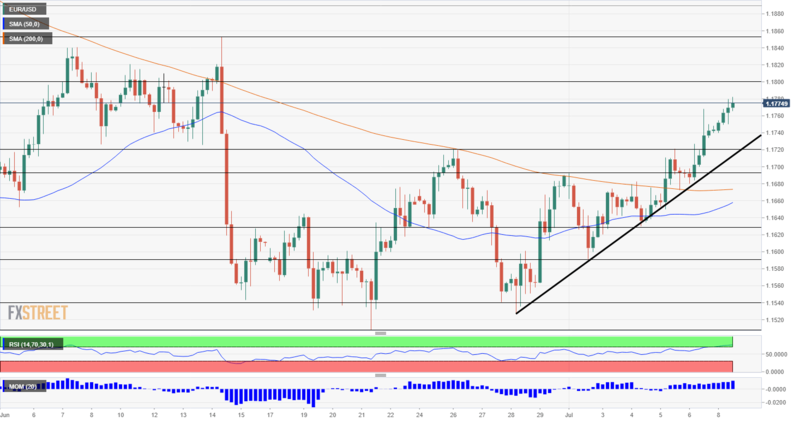 The EUR/USD trades above the uptrend support line that accompanied it since late June and seems to have drifted to higher ground and an accelerated pace of rises. Momentum remains upbeat, but the Relative Strength Index on the 4-hour chart has already entered the overbought territory, above 70. This is a bearish sign. Resistance awaits at 1.1800 which is a round level that served as a battle line in mid-June. More importantly, 1.1850 was the high point on June 14, before the pair collapsed. Even higher, 1.1915 was the January low and is of interest. Support awaits at 1.1720 which capped the pair on June 26th and July 5th. Further down, 1.1690 capped the pair in late June, and 1.1630 was a line of support in early July.